First, leadership is a superpower. Second, almost everything we’ve been taught about leadership is wrong. Inspired by Kruse's viral article "Why Successful Leaders Don't Have an Open Door Policy," this contrarian approach to leadership reveals why you should throw out the rulebook and instead play favorites, crowd your calendar, tell employees everything (even salaries), stay out of meetings, hide your phone, and more. Kruse makes the case for these principles with engaging real-world stories and case studies, and shows how to use this wisdom to buck the trend and become more effective. He also shares applications beyond the office—at home, in sales, in sports, and more. Ultimately, his advice empowers you to focus on what matters, which is the key to success for you, your employees, and your company. KEVIN KRUSE is a New York Times bestselling author and serial entrepreneur who started or cofounded several multimillion-dollar businesses. Kruse's articles on leadership have appeared in Forbes, Inc., and a number of other publications and his podcast, The LEADx Leadership Show has been downloaded over one million times. He is the founder and CEO of LEADx, with the mission to spark 100 million new leaders. He lives in Philadelphia, PA.
ʺDon’t forget everything you learned about leadership. 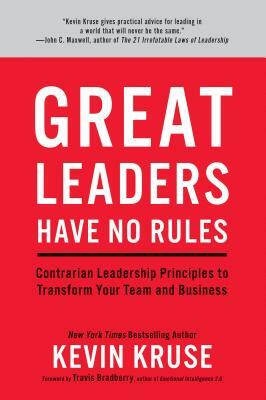 Add to it by reading Great Leaders Have No Rules: Contrarian Leadership Principles to Transform Your Team and Business. Kevin Kruse has assembled some sound leadership advice that integrates humanity and humility into the leadership equation. It’s a combination, complete with research and stories, that makes for compelling study and immediate implementation.” —John Baldoni, internationally recognized executive coach, Trust Across America Lifetime Achievement honoree, Inc.com Top 100 Leadership Speaker, author of more than a dozen books on leadership.